For years there have been craft brewers and craft vintners. In the past few years a number of distilleries have cropped up around the country. The MB Roland craft distillery is in Christian County, Kentucky. This is their still. The craft brewers and wine-makers have the benefit of laws and regulations that make it a little easier to start their operations. They have production limits. In the eyes of the Federal government (revenuers), there is no distinction. If you are seeking to legally produce a pint of shine, or 100 barrels the same stringent rules apply. 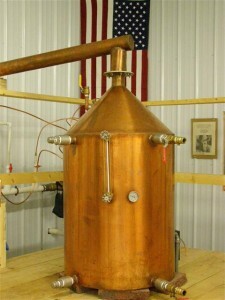 There’s a link on the home page for Craft Distilleries. You can review the map of the craft distilleries I’ve been able to find so far. I’ll be adding more information about each distillery as I go along. This entry was posted in Craft Distillery and tagged Craft Distillery, MB Roland. Bookmark the permalink.